What do you think turtles talk about when we just stare at them, with cameras pointed at them? Maybe their salt intake? Trouble sleeping? Irritating clown fish? 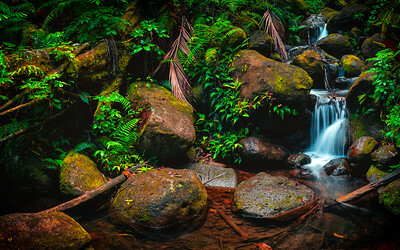 Waipio valley on the big island of Hawai‘i, a beautiful area full of lore from long ago. While remarkably fertile, it has and still is very difficult to reach. The valley is cut into the Earth, with giant cliffs embracing it on all sides. The legends of the valley range from Maui’s calabash containing the raging winds and storms that whip through every so often, to Nanaue. Nanaue was a man, born from an unusual chief that came from the waters. When he was born, he had a hole in his back, and when he grew into a man, it became the mouth of a shark, for Nanaue was a shapeshifter that would become a man-eating shark and stalk his fellow villagers while they bathed and fished. I hope this surfer is aware he may have company out there. 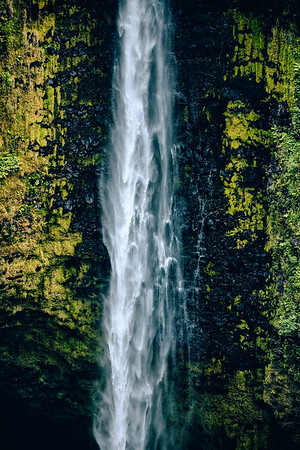 The Hamakua coast on Hawai'i is scattered with small streams, fed by the rains and waters flowing from the mountains. My first visit to the Waikiki Aquarium. They keep their glass very clean, making it easy to get photos of these guys. 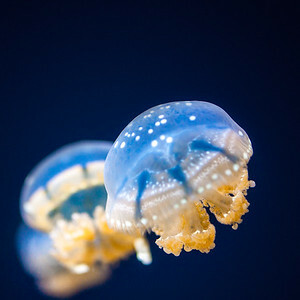 From my experience, it takes clean glass and relatively thin glass to take good photos of aquarium sea life. 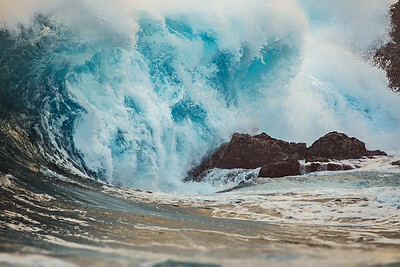 Taken in Hawaiian Beaches. When I was growing up and picking opihi along the coast was still a thing, almost every month, like clockwork, the coast guard helicopter would fly over my house. My mom and I knew it was because someone fell into the ocean, many times to their demise. The source itself. 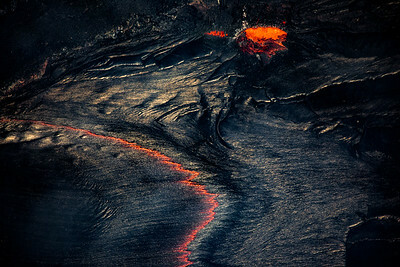 The raging lava makes its way from this volcanic cone down to the water's edge, burning anything it comes in contact with. This road is the coastal beach road connecting Hawaiian Beaches to Kapoho on the Big Island. I have had more than a few strange and fear-inducing experiences on this road. It's paved now because lava has poured over Kapoho, and this is one of the exits from that area, but before that it was poorly maintained. Along with my cousins and dad's friends, we used to spend our summers here, fishing for small shore fish and using them as live bait on a much longer flag line that went out for half a mile. My older cousin and I were short on live bait, so one night we drove through the forest down into a spot called Hau Bush. 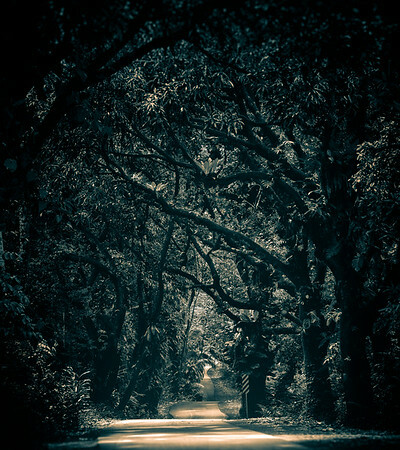 It's an overgrown path down to the ocean, and if it hasn't been accessed recently it's not uncommon to have to cut through some fallen branches with a machete. Sometimes you find people camping near the water, as there is some sand at the end of the drive, but none this night. We began to prepare our poles in the car when the wind picked up and I began to hear something that I had only heard about through old legends, babies... they were crying in the forest behind us. Mauna Kea sunsets are an experience that feels sacred. You're in a land that you know is old, and with history not only of the people and culture of Hawai'i, but of natural history as well. When you rise above the cloud layer and look to the horizon, it's as if you've transcended above the ordinary world that you knew, and can see a completely different Earth. This is atop Mauna Kea, on the Big Island of Hawai'i. The smaller mountaintop you can see in the distance is of Hualalai, the mountain close to Kona. The Hawaiians believed that upon their mountaintops there lived 4 very clever deities. 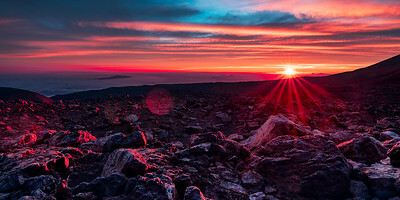 Kahoupokane lived on Hualalai's mountaintop, Lilinoe lived on Maui's Hale'akala, Poli'ahu, perhaps the most famous of the sisters, covered Mauna Kea's top with snow, and along side of her, also lived Waiau. 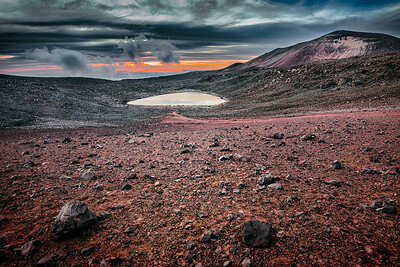 At the top of Mauna Kea there sits a lake with her name. Here, it was thought goddesses like Poli'ahu would bathe in Waiau's waters, and also that this was a piko to Wakea, the god of the sky. 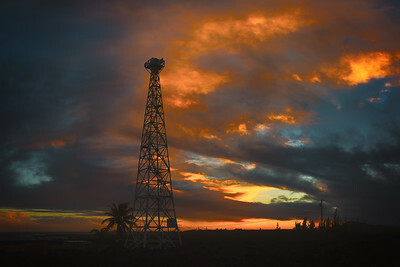 Locally, this converted lighthouse in Kapoho is riddled with legends and stories. All I know is that the sky out here is magnificent. 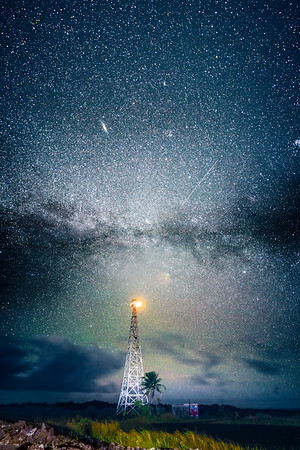 3 shooting stars, the Milky Way, and the Andromeda galaxy all in one. Hawaiian Beaches is a subdivision in Puna, on the Big Island of Hawai'i. It's a rural residential area that certainly has had it's problems. 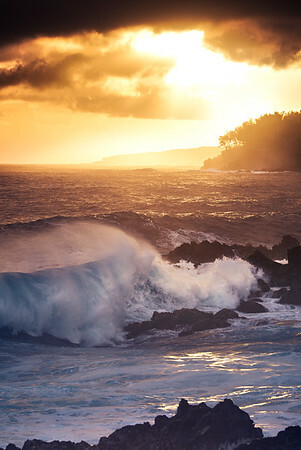 The waves that roll into this small area of Hawai'i have always been very magical to me, though. 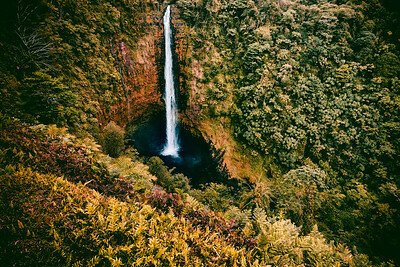 'Akaka falls on the big island of Hawai'i is a massive waterfall that ends in a hollowed out gorge, like an 'ipu that's being filled up with water. Diamondhead is a huge volcanic tuft cone on O'ahu. It was created half a million years ago when O'ahu was still over the hot spot in the pacific plate that feed our islands. 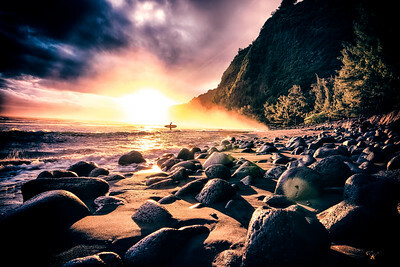 O'ahu is thought to be made from two large shield volcanoes, Wai'anae and Ko'olau. Ko'olau is the volcano that fed this tuft cone. The Hawaiian name for Diamondhead is Le'ahi, which means the brow of the Ahi tuna. A friend of mine taught me about two huge rocks that reside in the lava fields here. The ancient Hawaiians would use them at dawn to tell when the winter and summer solstice would arrive. A crater of fire spewing flames into the heavens. Halema'uma'u crater with Orion watching overhead.